One of the best things about miniature painting (unlike, for example, pediatric surgery) is that you get second chances. 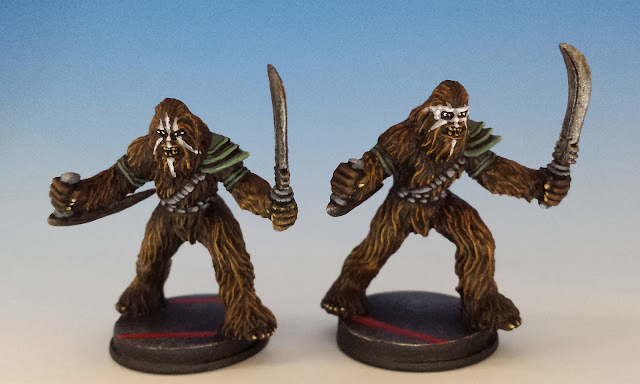 A few weeks ago, I painted the Wookie Warriors for Star Wars Imperial Assault. Instead of dry-brushing, I painstakingly highlighted individual hairs. It took forever, and the end result was bland and oddly reminiscent of a cat turd. To make matters worse, when it came to their big swords, I tried to emulate the past success I enjoyed in using non-metallic metals when painting Imperial Assault firearms. But on such a large blade, my NMM technique collapsed entirely, making the Wookie swords look streaky and artificial. Time for a mulligan! 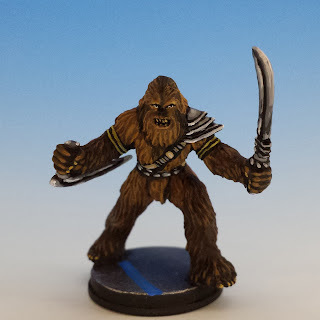 Wookie Warriors are such a useful unit in the Imperial Assault skirmish game, I splurged on another pack, which I painted up a few days ago. I much happier with the result: a simple dry-brushing of the fur, and more (metallic) dry-brushing on the weapons. Each miniature only took me about an hour to paint, and I'm vastly happier with the results. Sometimes, simpler is better. The most important addition, of course, is the warpaint. 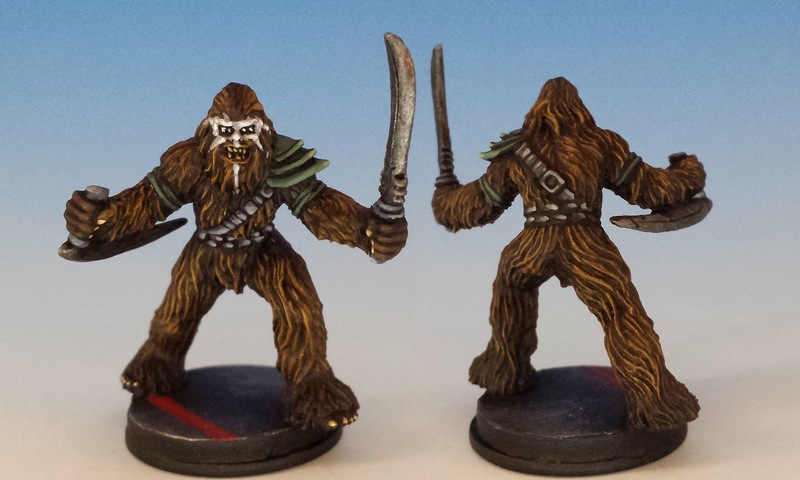 I think it makes the Wookies look angry and a little crazy, rather than just hungry (which is what my original Wookies seemed to convey). I love putting warpaint on a miniature - it always requires a certain amount of daring, since one false stroke can ruin the whole face. I just had to plunge in, like a Japanese calligrapher... and hope that I didn't need a mulligan on my mulligan. If you're interested Imperial Assault, I recommend you check out boardwars.eu. Not only do they have the most insightful podcasts and articles about the game, but they are featuring my paint-jobs in their excellent miniature reviews. I'm really honoured. Fantastic Wookies! I love brown painting! Told you your paint jobs were world class! These wookies look great (rebel scum ahem) they should be publishing your tactics as well; storm troopers bring down THE FETT et al? Who would've seen that one coming? Again sully amazing work, but can get back on the dark side? Is an IG-88 or a royal guard champion too much to ask for?